Parmesan Smashed Potatoes served with roasted garlic aioli is an easy and hearty side dish. Smashed potatoes are easy enough for weeknight meals yet super impressive and perfect for entertaining! 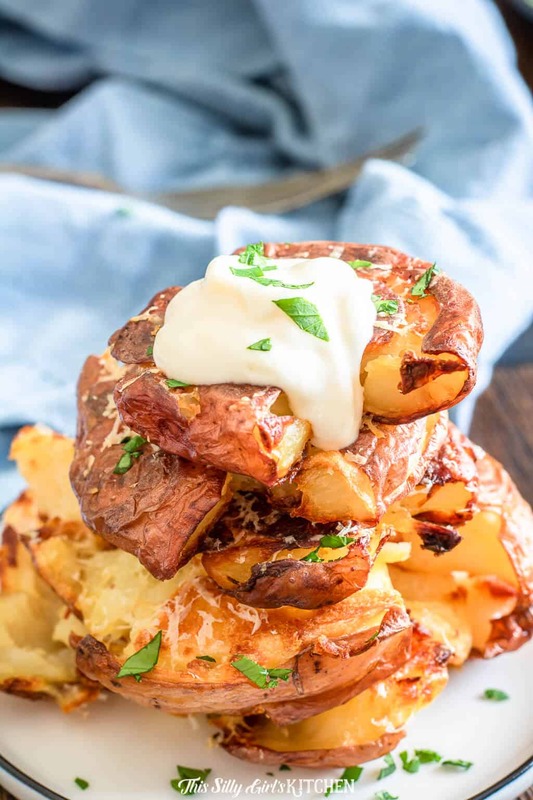 It’s no secret that we LOVE potatoes around here, I have so many potato recipes already here on the blog, but these smashed potatoes are next level. Thank you so much to Side Delights® through Kitchen PLAY. As always, opinions are my own. 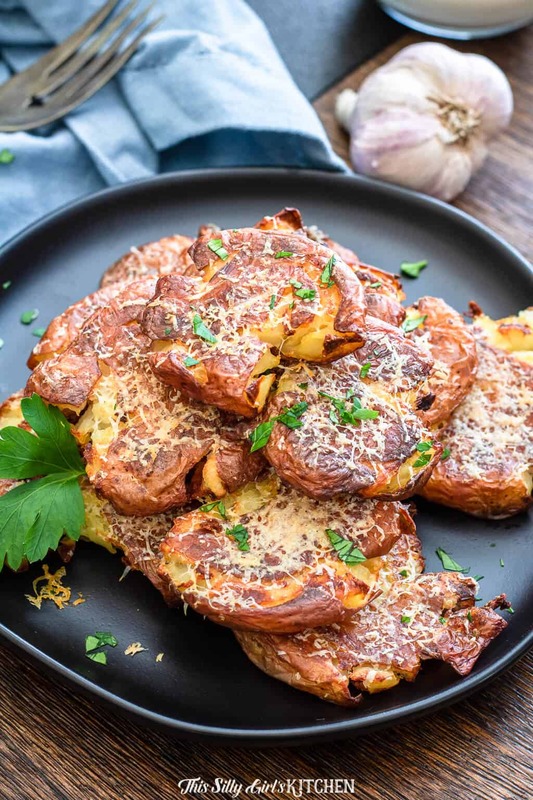 These parmesan smashed potatoes make for a wonderful side dish, but I like to serve them as appetizers and snacks as well! 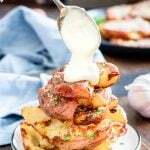 You can take this same technique and make smashed potato nachos – hello! Okay, I am definitely putting that idea in my arsenal, so watch out for that post! Side Delights® offers most every variety of potato right in your local grocer. Along with their amazing products, they also offer tons of recipe ideas on their website! I got today’s smashed potato recipe right from the Side Delights website. 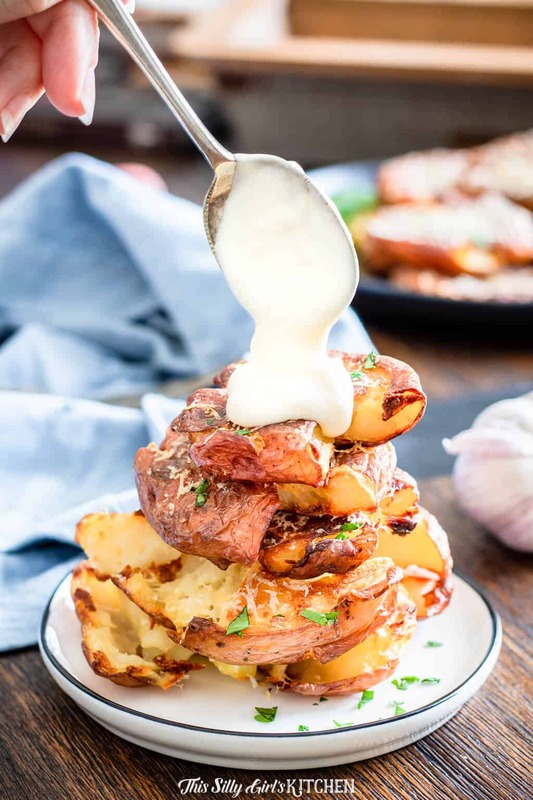 You can serve these parmesan smashed potatoes as-is or with the roasted garlic aioli recipe below. I highly recommend making the aioli to go with them! Addictive. 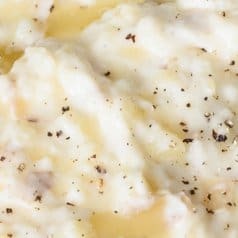 Garlic smashed potatoes?? Yes, please! 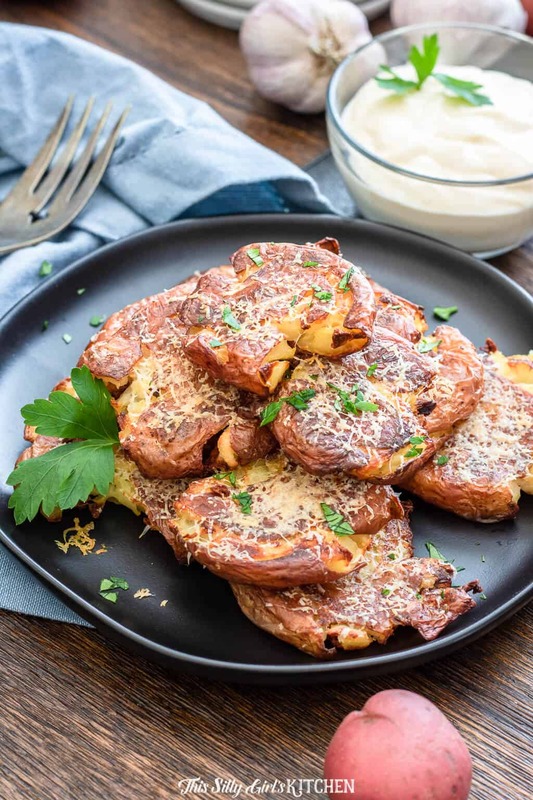 Crispy on the outside, creamy on the inside, with a nice salty kick from the parmesan cheese, you cannot go wrong with these smashed potatoes! Smashing potatoes? 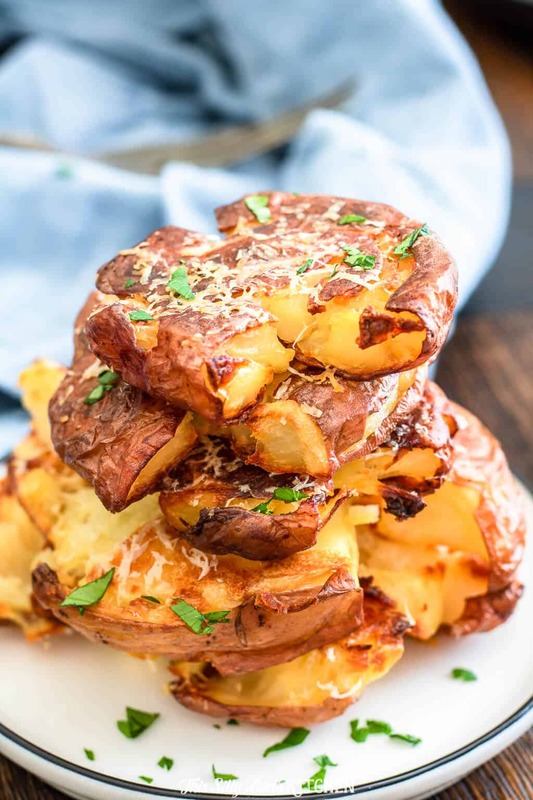 Yes, it might seem weird but this allows for the interior of the potatoes to be moist and creamy while the outside skin crisps up and becomes that golden brown deliciousness we all love. I like to use small creamer potatoes, the red potatoes in the Steamables pouch from Side Delights to be exact. The recipe on their website calls for you to boil the potatoes and then smash them. But, with the Side Delights Steamables, I skipped that step, cooked them in the microwave per the directions on the back of the bag, and then smashed them. A small, tender potato like a fingerling or creamer potato works best. I used Side Delights Steamables in the red potato variety. I used these for the pop of color they give to the dish. Steam potatoes in bag per directions on the back of the bag or, place potatoes in a large pot with cold salted water, bring to a boil and boil 20-30 minutes until potatoes are tender. Take potatoes out of the water or bag very carefully and let cool to the touch, about 15 minutes. Preheat oven to 425°F and spray a sheet tray with cooking spray. Smash potatoes with the palm of your hand or with a heavy-bottomed glass and place onto the sheet tray. Smash so they are flattened but still intact. Brush both sides with melted butter and bake for 20 minutes. Turn, sprinkle with parmesan cheese, and bake an additional 20 minutes. Potatoes will be golden brown and crispy. 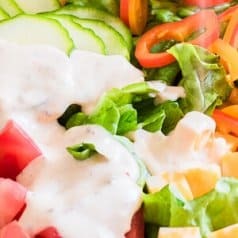 Serve as-is or with roasted garlic aioli! 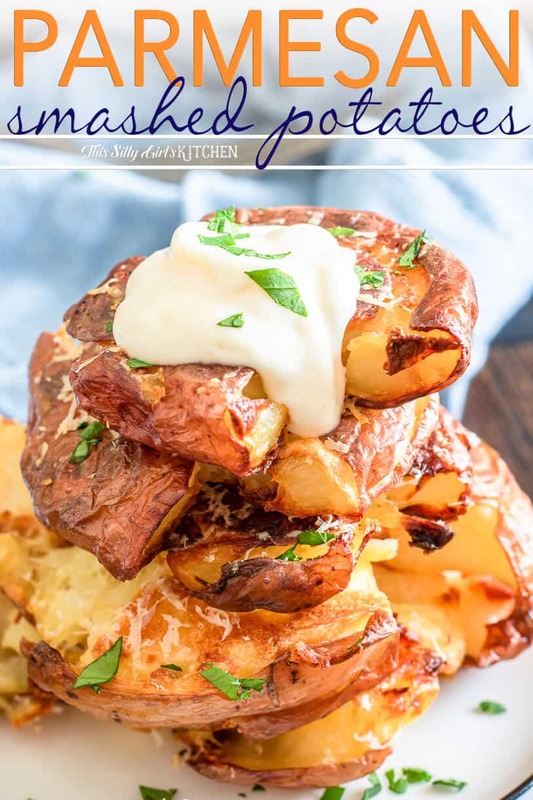 Don’t forget to check out my other potato recipes such as Roasted Garlic Mashed Potatoes, How To Fry Potatoes – Red Potato Wedges, and Homemade French Fries! This needs to be made first so it can sit while the potatoes cook. Mash garlic into a small bowl, add the remaining ingredients and mix until combined. Cover in plastic wrap and place in the fridge until potatoes are done cooking. Place the Side Delights Steamables into the microwave and cook per the directions on the back of the bag until tender. ** Let sit until cool to the touch. Preheat oven to 425°F. Spray a sheet tray with cooking spray. Taking the palm of your hand, or a heavy bottomed glass, smash each potato one by one. You just want to flatten them out, but make sure they are still intact. Place potatoes on the sheet tray, not touching. Brush with the butter on both sides. Bake for 20 minutes, then flip the potatoes over. Sprinkle the cheese on each one and bake an additional 20 minutes. Potatoes will be crispy and golden brown on the outside, creamy on the inside. Serve with garlic aioli. *To roast garlic, preheat oven to 350°. Cut the top off the garlic, just so the cloves are exposed. Place into a piece of foil that will cover the whole head of garlic. Drizzle with 1 teaspoon olive oil and a pinch of kosher salt. Seal foil around the garlic and bake for 1 hour until the garlic cloves are soft and lightly golden brown. **You can also boil the potatoes if you do not have the Steamables variety. 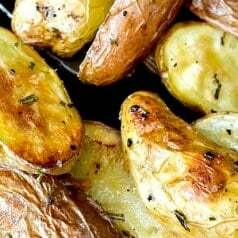 Just place potatoes into a medium-sized pot covered with cold water and 2 teaspoons of kosher salt. Cover, bring to a boil, cook for 20-30 minutes until potatoes are fork tender. Drain, and set aside until they are cool to the touch.